Mumbai: Auto makers are preparing to launch a raft of new cars and two-wheelers over the next two months in an attempt to revive sales hit by sagging consumer confidence, a credit crunch and high borrowing costs. Market leader Maruti Suzuki India Ltd will kick off the new launch season in the current quarter with its A-Star model. 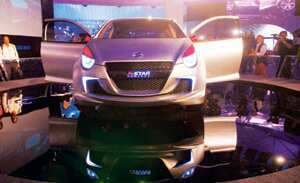 The company is positioning the car in the so-called B segment, which also includes its Alto, WagonR and Zen models. Hyundai Motor India Ltd is gearing to launch a premium compact car called the i20 and Fiat India Pvt. Ltd will offer a sedan called the Linea. Mahindra and Mahindra Ltd (M&M) is unveiling the Xylo, a multi-purpose vehicle, while Skoda India is preparing to launch a new variant of its premium sedan, the Superb. Hero Honda Motors Ltd and Bajaj Auto Ltd will unveil new bike models and variants. Maruti Suzuki ended October with an 8% decline in domestic sales during the month to 59,127 units, from 64,258 a year earlier. Bajaj Auto sold 163,850 motorcycles, a decline of 34%. TVS Motor Co. Ltd reported a decline of 9%, with 117,101 units. Companies reporting growth included Hero Honda, Hyundai India and General Motors India Ltd. Hero Honda sold at least 600,000 two-wheelers, an increase of 12.1% over its previous highest October sales in 2006 and almost 64 % over last year. Hero Honda’s reach in smaller towns and cities, where its competitors have a limited presence, coupled with four new launches, spurred its sales, said Sandeep Bafna at Fort Point, a Mumbai-based dealer for the company that sells Hero Honda models across Maharashtra. The new launches follow the central bank’s attempts to boost liquidity in the financial system and prod commercial banks to lower borrowing costs. On Saturday, the Reserve Bank of India (RBI) lowered its key interest rate and reduced the proportion of deposits that banks have to keep with it and invest in government bonds. Auto makers say sales will bounce back with the return of liquidity. “We believe lots of issues in the Indian context are linked to the short-term issue around the credit availability," Rajesh Jejurikar, chief of operations at Mahindra and Mahindra, said on 31 October. “The situation would improve over the next few months as there (are) already actions in place." The downturn is a mere blip in the India growth story, said Thomas Kuehl, a member of the board of directors at the India unit of Skoda. “We don’t see the crisis to be ongoing as money might be out of the system but (has) not vanished," Kuehl said. “Hence we expect India operations to play an important role in our growth plans." 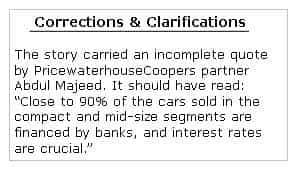 Partner of PricewaterhouseCoopers Abdul Majeed said that having announced the new model launches, auto makers had no option but to go ahead. High interest rates may still prove to be a deterrent for buyers, he said. Close to 90% of the cars sold in the compact and mid-size segments are financed by banks and interest rates, said Majeed. The auto industry also draws a bulk of its buyers from sectors such as information technology (IT) and IT services companies that include high-income, upwardly mobile customers. In the face of the global financial crisis that has prompted clients to spend less on IT, these companies have scrapped festival bonuses and deferred increments, reducing the buying power of their employees. But Mahantesh Sabarad, an analyst at Centrum Broking Pvt. Ltd, said the new launches are timely given that RBI has just cut key policy rates and commercial banks will likely lower borrowing costs. “There couldn’t have been a better time to launch new models," he said. The RBI move will “surely help in improving the sentiment. We do expect (to see) banks slashing interest rates."